We are a San Diego based Clown Alley dedicated to promoting the art of clowning through volunteering for children and health related events in San Diego County. The San Diego Clown Conspiracy is registered under COAI Alley 371 and WCA Alley 88352. Let's start scrolling and learn more about us. 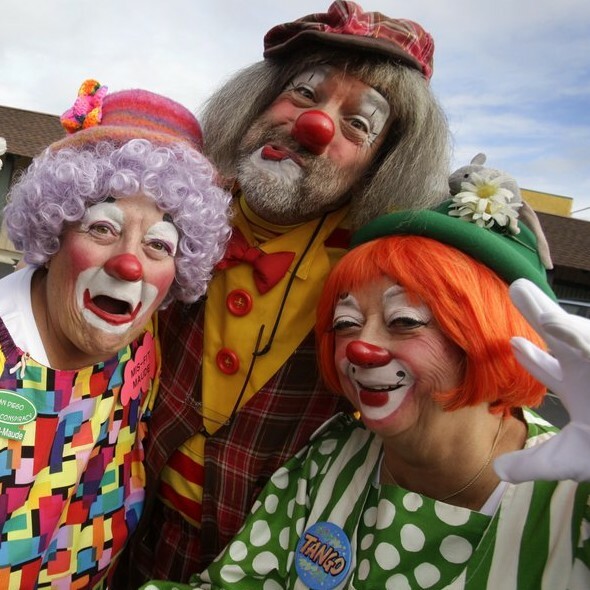 San Diego Clown Conspiracy is a group of like-minded people from all walks of life and ages, who love the art of clowning. They have the ability to make children of all ages smile, and they enjoy doing so. The San Diego Clown Conspiracy (SDCC) is a member of WCA, (World Clown Association) and of COAI (Clowns of America, International). SDCC is a volunteer organization devoted to clowning for the Military and their families, for health or children-related Walks, and MDA. Occasionally, SDCC will be in a parade. Each one of our clowns is extremely talented in various areas. Mis-Fit Maude and Bow Peek do glitter tattoos that will last up to seven days. Bunkers, MaxAna, Smar-T-Pantz, LoMax, Jojo and Tango do air brush tattoos. Whistle Stop, Bunkers, Wee Willie and LoMax are expert balloon twisters. They can literally transform a 260 balloon into whatever creature or thing a child may want. Smar-T-Pantz, Uncle Rusty, Pockets, Anita Laf, Smartypants and Tango face paint. Uncle Rusty and LoMax do wonderful magic. Everyone can and do successfully bring smiles to faces. SDCC members encompass many fields in their every day life. We have engineers, CPAs, accountants, artists, retired military, retired insurance adjusters, school bus drivers, Shrine members and a high-school student. Altogether, we have a total of a hundred or more years clowning. Pinkie has been a clown for most of her life - 12 years. She started clowning when she was a mere five years old. LoMax has been clowning for 38 years. We, each had our own special reason for becoming involved with clowning. We are introverts, extroverts or "clowns" in our everyday life; however, once the make-up is on our faces, we become clowns. We shed our everyday face and life and take on a new persona. We continue to attend clown education. We take classes. We go to clown camps and retreats, and clown conventions where we compete against other clowns from all parts of the world. We have a "clown school" where we can teach anyone who is interested in becoming a clown. It is a 40-hour course and quite inexpensive - there is no charge for the instruction, one only has to pay for makeup, a nose, a wig, balloons and pump, etc. Contact us if you have any questions or just want information. I don’t have enough words to thank you for all that you do for our Marines and their families. Your presence at our Family Days really makes a difference! Thank you! Thank you so very much for supporting the recent Family Days held by our H&S Company and Bravo Company. I truly appreciate your continued support to the Marines & Sailors of the 1st Radio Battalion! Congratulations on your “Alley of the Year” award! You deserve it and much more for all you do. Thank you for your continued support of MDA. Congratulations and we hope to see you soon! We want to thank you for your generous support this past December and your commitment to the Christmas at the Q. You are helping families in our community and is sincerely appreciated. Thank you for your participation in the Polinsky Children’s Center Second Annual Health Fair .. The face painting was a great hit and the youth truly enjoyed interacting with you and your friends. Would you like to make contact with the San Diego Clown Conspiracy? Use the form below to send us an email and one of our head clowns will get back with you in a jiffy!